Sportsister recommends Gear for Girls, the specialist women’s outdoor retailer. With a small shop in Wooler, Northumberland and an impressive online store it’s a must for outdoor enthusiasts. While the store was a very welcome additon to the local retail scene, for those of us not in that area of the country there is the online store at www.gearforgirls.co.uk. And the friendly, fast and efficient sevice you find in store is also on the end of the telephone should you need any help with your ordering. The extensive selection of products has been thoughtfully chosen to ensure all your outdoor needs are covered, and there is a good choice of otherwise hard to find brands. Key brands include The North Face, Salomon, Falke, Merrell and Mountain Hardwear. And there is an emphasis on ethical brands such as Patagonia, prAna, Keen and Icebreaker, which currently account for 35% of the sales. Gear for Girls is hoping to grow its ethical sales to at least 50% for 2009. Sports covered online and in store include climbing, walking, running, cycling, trek & travel and yoga. And the product range is extensive and includes sports bras and baselayers, fleeces, down jackets, waterproofs, soft shells, shorts, capris, climbing shoes, yoga mats and trainers. With such an authentic company it’s no surprise to learn that the brains behind Gear for Girls is herself an avid sportswomen. 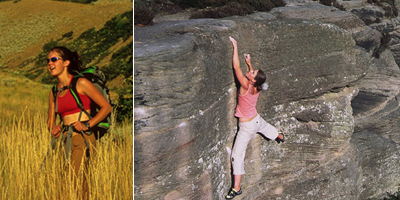 Owner Alison Wright has spent all her life running, mountaineering and climbing throughout the world. At the age of 21, she broke the world record for running from Everest Base Camp to Kathmandu; 188 miles and 42,000 ft of ascent completed in 3 days and 10 hours with her friend Helene Diamantides. The record has recently been broken by The North Face sponsored athlete Lizzy Hawker together with Stephen Pyke. www.gearforgirls.co.uk As with many independent retailers the online offering at Gear for Girls is much larger than what’s actually available in store. The site is clean and modern and most importantly easy to navigate allowing you to search by brand, product area or activity. Climbing, walking, running, cycling, trek & travel and yoga. Passion. It’s more than just a business for the team behind Gear for Girls; they are genuine and passionate about inspiring more women to get into sport. Check out their blog site www.gearforgirlsblog.com with contributions from some top athletes including Britain’s ultra distance runner Lizzy Hawker and the American climber & mountaineer Zoe Hart. If you visit the website and sign up for the Gear for Girls newsletter not only will you be kept up to date with new an events from the store but you can get a 10% discount off your first order using the discount code friend. Also, the emphasis on ethical products and the plan to boost this area to account for half of all sales in 2009.